I nearly didn’t write this post today. You may think there’s some philosophical reason for this, but if that’s the case you’re crediting me with too much intelligence. The sad fact of the matter is that I had no idea it was Thursday. The past week has been a lovely break from the norm. We’ve seen family, walked the dogs, relaxed at home and played games. We’ve eaten too much, drank too much and made New Year’s resolutions that we’re determined to stick to this time. My husband and I have both been to the pub with friends and the whole thing has been a rather relaxed affair. On Christmas day, Libby woke up early and completely missed the bag of presents in her room. She asked if she could go downstairs and see if Santa had been and we said she could. In the event, she got to the bottom of the stairs and decided she was too nervous to go into the living room in case he was still in there. When she came back upstairs, both girls finally noticed their presents. We brought them into bed and all sat together in bed to open them. My husband’s favourite present of the day came later on. 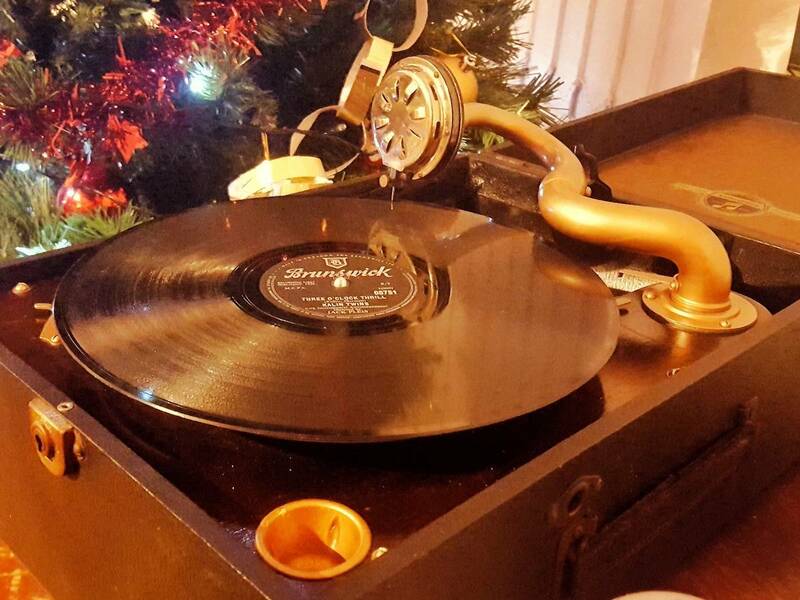 My mum kindly gave him this vintage gramophone that used to belong to my granddad. We think it dates back to the 1940s and you have to wind it up to keep it going. It certainly creates and atmosphere although without a volume control, it’s rather loud! As a blogger, I take photos every day. And yet when the girls opened their Christmas presents, I didn’t get the camera out. Actually, I still haven’t taken photos of them with their gifts. There are a couple of reasons for this and I do know it might be a bit controversial that I wasn’t clamouring to capture those memories. The girls didn’t have loads for Christmas. They had quite a large sack of presents from Santa. A couple for each of them and a few to share. They also had a few lovely presents from friends and family, some of which were under the tree in the morning and others they received during the day or when we saw them after Christmas. But I somehow feel that sharing photographs of them isn’t the right thing to do. Everyone chooses the aspects of their lives that they share online and even chronic over-sharers like bloggers have to draw the line somewhere. And personally, I don’t want to share anything that will make someone else feel bad. My girls are lucky. They received some lovely gifts and they were delighted with them all. But not all children are that fortunate at Christmas. I can’t stand the thought of somebody reading my blog during Christmas week and feeling sad that they couldn’t afford much for their child. Because Christmas isn’t really about gifts is it? It’s about being together as a family and making memories. The other reason I didn’t want to take photos while the girls were opening their presents was because I just wanted to be there. I wanted to be totally submersed in the moment, the happiness and the magic, not trying to get the perfect photo. So our Thursday photo #138 isn’t of Christmas day or opening presents under the tree. 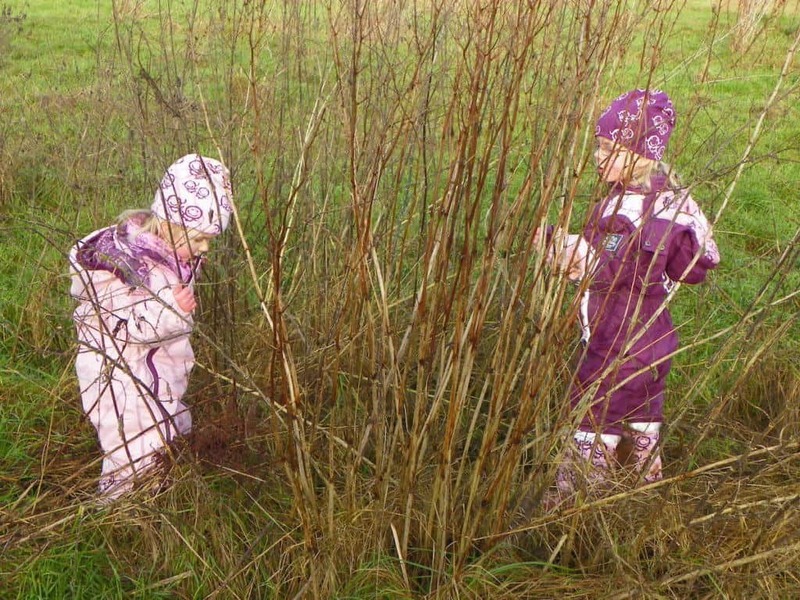 It’s of the girls outdoors exploring, enjoying their time together before Libby goes back to school next week. Normally I take loads but as the boys all wanted one big expensive present and then a few small surprises there wasn’t much to photograph. I love this post Nat! I took photographs and shared them on my personal Facebook but that’s because we have family who can’t see us over Christmas and we love to share our days. My Nan has loved seeing the photographs of our Christmas when I showed her earlier in hospital but I won’t share them all on social media for blog followers just because it’s a family thing. I haven’t shared any photos of our Christmas, either. I may or may not get round to it – but for hte time being, I want to keep them all for me! I do love that gramaphone, though. Beautiful. Thank you, I’m so glad you like the new theme, I’m really pleased with it!